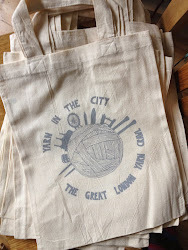 Yarn in the City: The Great London Yarn Crawl: The Routes! Here are the routes for this year's Great London Yarn Crawl! We have tried to make these as reasonable as possible in terms of travel time, aiming for less then an hour transfer between shops (times given in graphics are approximate transit times). However, that does not take in to account any changes in TFL service on the day, or their plans vis a vis maintenance/upgrades/etc. If there are any major disruptions that arise, the routes may need to be altered to accommodate those changes. Just keep an eye on the blog and the Ravelry group as we get closer to the time and we'll keep you updated. Every route contains four shops and every shop is scheduled on three different routes. All routes will end up back at Waterloo Station so we can meet up at The Mulberry Bush pub for the after party. Take a look and see what routes tickle your fancy – registration will open within the next two weeks (we'll post an update as to the exact timing), so be prepared with a first and second choice of route to ensure you get one that you want. The pictures give estimated travel times between shops – actual timings (the actual time window within which you'll be at each shop) will be finalized closer to the time. Enjoy! The Red Route begins on the North side of London in Crouch End, at Nest. Then team members hop on the bus toward Finsbury Park, and the Handweaver's Studio. A quick jaunt over to Bethnal Green (and lunch) takes Red Routers to Prick Your Finger. The Red team ends their day at loop in Islington, before a quick Tube trip back to Waterloo. 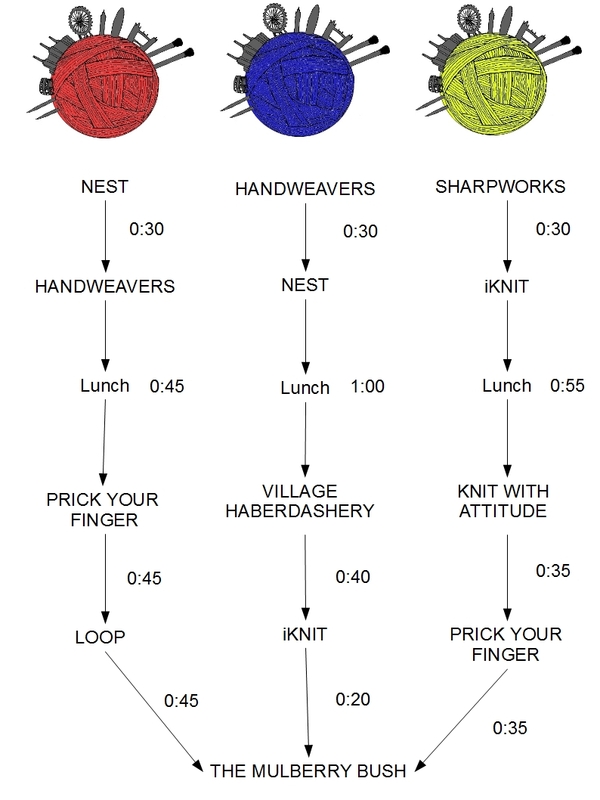 The Blue team starts off at Handweaver's Studio before reversing the Red team's route to Nest. Lunch (either in Crouch End or West Hampstead) precedes a visit to the Village Habedashery. Then the Blue Route takes participants to Waterloo, and iKnit, before meeting up at The Mulberry Bush. The Yellow Route starts in the southeast, at Sharp Works in Herne Hill. Hope on the train to hit iKnit before lunch, then venture north to Knit with Attitude in Stoke Newington. Back on the Tube to Prick Your Finger in Bethnal Green, and then to a well deserved pint in Waterloo! 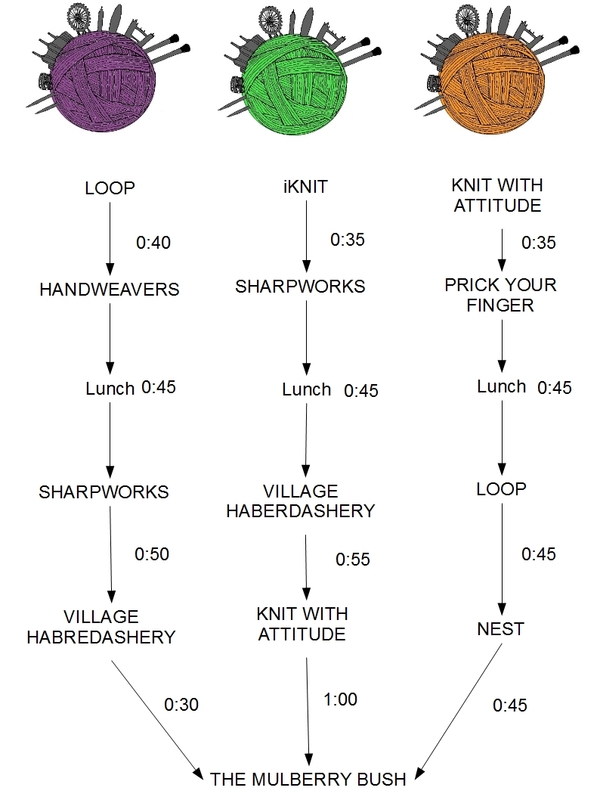 Intrepid Purple Team members will start in Islington, at loop, then hop on the bus up to the Handweaver's Studio. Then it's down to Herne Hill for lunch (there's an awesome pub!) and a visit to Sharp Works. Back up north to the Village Haberdashery, and then home to Waterloo. This route starts at the end, with a visit to iKnit first thing. Then hop on the train for a quick trip to Sharpworks in Herne Hill. Stay here for lunch, or grab a bite in West Hampstead before hitting the Village Haberdashery. Finally head over to Stoke Newington and Knit With Attitude before heading back to the Mulberry Bush and the after-party! 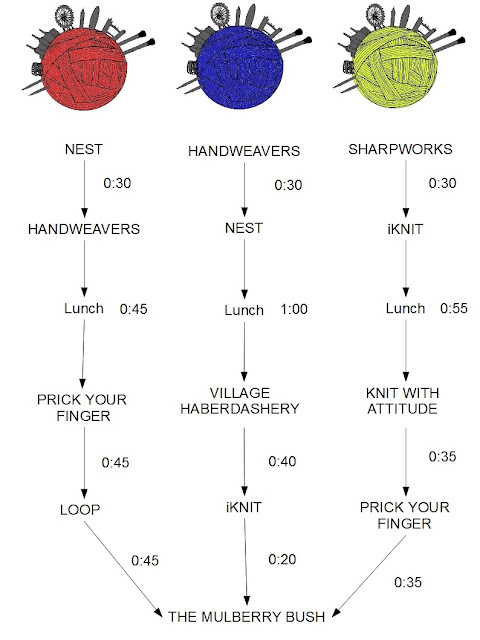 This route starts in Knit with Attitude in Stoke Newington, then hits Bethnal Green and Prick Your Finger. Hop on the tube to Angel for lunch and a visit to loop, and then a quick bus trip to Nest, before heading back to central London and the pub!